Google’s Featured Snippets may be obtained instantly when a website provides a clear answer to a question people are asking Google, especially if the question has never been asked before. How I got a Featured Snippet in under 60 seconds. I have been playing with Featured Snippets since they came out and have obtained several hundred spots in “position 0”. In general, these “answer boxes” (usually) drive quite a bit of traffic. Today an opportunity appeared to grab a Featured Snippet. I figured there was a tiny chance that I’d get a result in “Top Stories” but my goal was a paragraph style snippet with an image. Elon Musk tweeted ““I have prehensile eyebrows”. Elon Musk has 21 Million followers. Of course, thousands of people instantly turned to Google. 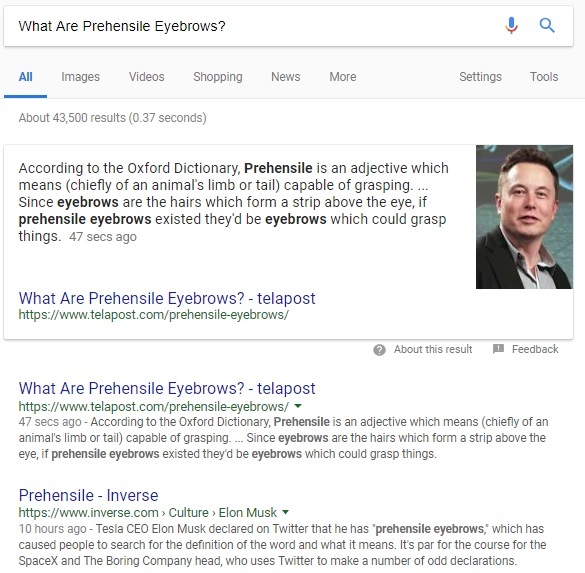 A typical search query would be “prehensile eyebrows” or “What are prehensile eyebrows?”, especially for a voice search. There was no good answer to the question “What are prehensile eyebrows?”, so there was no Featured Snippet. So, I wrote the article “What are prehensile eyebrows?”. I had the page crawled and the Featured Snippet instantly appeared within a couple of seconds. I nearly forgot to take a screenshot but I did obtain one 47 seconds after the page was live. Unfortunately, I discovered the quirky tweet about 14 hours after it was tweeted, so, I missed out on all the juicy traffic. But, I’ve had Featured Snippets for things like this before and they generally result in 5,000 – 20,000 hits and occasionally a natural backlink or two. But, what was interesting to me is that the Featured Snippet appeared anyways, even through interest had died down. 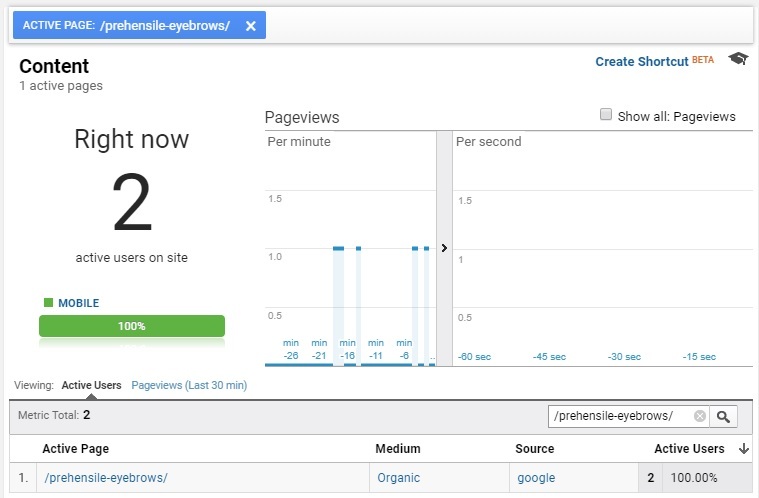 Indeed, I looked at the page in Google Analytics and it was obtaining about 2 hits at any given time. lol. Not much traffic at all, however, the experiment was a success. The traffic wouldn’t do anything for me anyways; it is just fun to watch. I don’t see any good examples today, but if you search for things such as “Car crash Los Angeles” you will generally see a recent story in either Top Stories, as a Featured Snippet or even as a top search result. Google is paying more attention to user behavior and delivering more timely results based on user intent and trending topics. This can be valuable information for obtaining search traffic at critical times for content creators. Update 5/2/2018: I do believe I just solved the mystery behind Elon Musk’s mystery tweet. If interested, see: Elon Musk’s “Prehensile Eyebrows” Tweet is About Snapchat’s Eyebrow Weightlifting Game.